Mini Cherry Cheesecakes are the perfect size for parties and showers, and with just six ingredients, they come together in a snap! 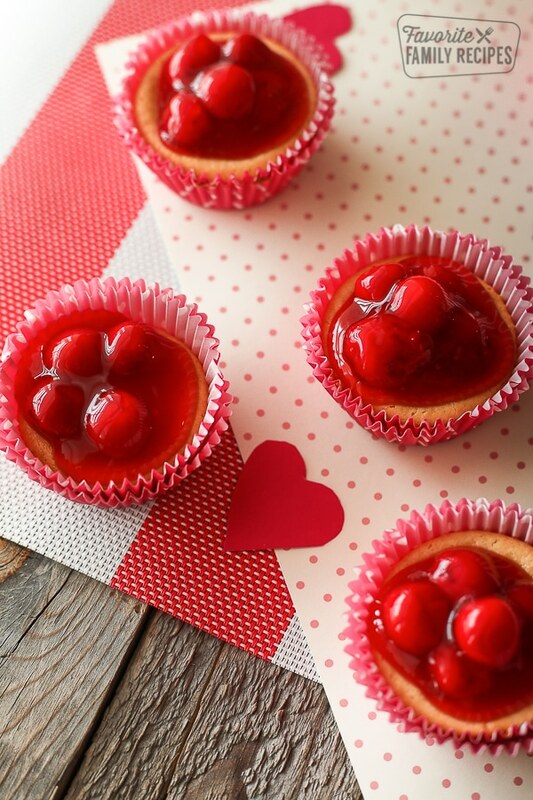 Sweet little Mini Cherry Cheesecakes are such a cute dessert to make and serve at just about any gathering. I was gifted this recipe at my bridal shower (I’m not going to admit how many years ago that was!) and it has been one of my go-to desserts for special occasions ever since. 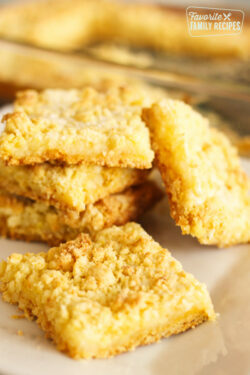 They’re simple to make, easy to serve, and can be changed up all kinds of ways. 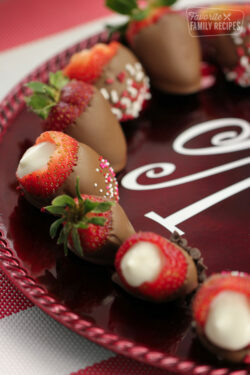 This is a really budget friendly dessert too! I usually try to find cream cheese at a dollar or less and stock up. This recipe makes about 18 mini cheesecakes. Get creative and use other toppings! I have used peach, blueberry, raspberry and lemon pie fillings. All of them were beautiful and so delicious. Try fresh fruit too! Kiwi, strawberries, blackberries, raspberries or any combination of fruit would make a gorgeous summer treat. If you are going to use fresh fruit, I would suggest a layer of whipped topping before adding the fruit to adhere it to the top of the cheesecake. Because these cheesecakes are meant for individual servings, you could offer a topping bar at your next party. Let guests top their own cheesecakes with all kinds of toppings, including those listed above, plus chocolate chips, nuts, butterscotch chips and candies. 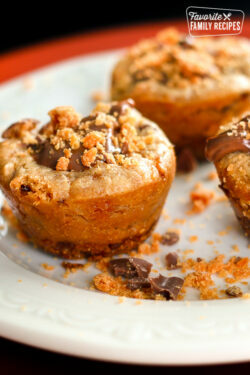 You can also drizzle them with chocolate syrup, caramel or butterscotch. Top with caramel, chocolate and walnuts for a turtle cheesecake. The possibilities are endless! I am crazy about everything cherry. 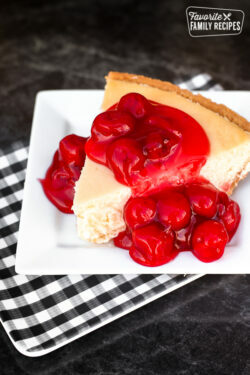 If you love cherries as much as I do, we have some other cherry recipes you will definitely be interested in! Chocolate Cherry Cake– this is a tasty pudding based cake. Microwave Cherry Crunch– easy to make and cooks in the microwave for a fast dessert. Cherry Vanilla Cookies– like chocolate chip, but better! Old Fashioned Chocolate Covered Cherries– little bite sized cherry chocolates with a creamy filling. Chocolate Cake with Cherry Topping – chocolate cake with cream cheese frosting and cherry topping. Alligator Jaws– one of my favorite cherry recipes! A triangle shaped doughnut with cherry cream filling. Cherry Limeade Cupcakes– a tart yummy cupcake great for any occasion. Put a vanilla wafer, flat side down, in the bottom of each liner. Beat eggs, vanilla, sugar, and cream cheese together until smooth. Fill each liner with 2/3 of the cheesecake batter. Top each mini cheesecake with cherry pie filling. Love these – thank you. I made these today for a graduation party and they were a huge hit! Thank you for the recipe! We just used a canned cherry pie filling. It was pre-done. Hope this helps! I have no idea how you got vanilla wafers into the mini muffin tins . You never said to use the mini vanilla wafers. Also this recipe made 36 cheesecakes. Hi Cindy, These mini cheesecakes are made in regular size muffin tins in regular size cupcake liners, which do fit a vanilla wafer. It is a “mini” size as compared to a regular size piece of cheesecake. I’ve never made them in a mini muffin tin, but that explains how you were able to get 36 cheesecakes from the recipe. I’m glad to know they can be made in an extra mini size. I’m sorry for the confusion. Nilla wafers from Nabisco also come in mini size. So I use the mini muffin tin, mini liners, and the mini wafer to make the cheesecakes. Great for bite size treats! Good to know! I haven’t seen the mini size. Thank you! How many cakes does it make ? The recipe makes 24 cheesecakes. Thanks for asking! Can I substitute Splenda for sugar? Yes, you can. I believe you can substitute Splenda for sugar at a one to one ratio in baking and cheesecakes. It should work great. Thanks for asking! can recipe be halved so not as many cupcakes are made? I made the same error in thinking the recipe was for Mini muffin size. I used a cookie cutter to cut down the vanilla wafers into smaller circles to fit. I used raspberry filling for topping, yum! Whoops! Sorry about that. They actually do make the “Mini” Nilla Wafers that you can put in the mini tins. Maybe for next time! Love, love, love this recipe! ???? I’ve made it s several times for family and friends! So glad you like it! We love this one too. They are just so easy to make! Could this work with some no back cheesecake or perhaps the cheescake filling that is in the dairy section? Sure! I don’t see why that wouldn’t work. The crust might be a little more crumbly because it isn’t baked but it would probably taste just fine! Hope this helps! If I make these can I use an oreo cookie? Whole or half? I haven’t tried it that way before, but it sounds delicious! Let me know how it turns out! Delicious cakes… Easy to make… Loved it. So glad you liked these cakes! Thanks for the 5-stars!